There are several houses along the Sidehead Road. My great-grandparents Harry & Annie Elliott lived on Sidehead Farm, later their son Isaac took over the farm, then his son Gordon, until it was sold in the 1980s. The photo on the left was taken before they moved to Sidehead. 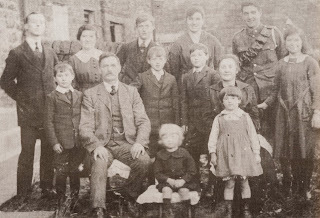 It was taken at Wintergap above Ireshopeburn in about 1918 and shows the family of 11 children with their parents. From left back: Isaac, Alice, Tom, my grandma Isabella, Harry. Front: Bert, Harry Elliott, Laurie, Ted, Annie Elliott, Elsie. Arthur and Annie at the front.